I have a lot to be thankful for: my family, my friends, my health, my etcetera, etcetera. I am also thankful that I trans. Sure being trans has its ups and downs, but it has been an interesting trip and it certainly has not been boring. Beyond the pages of DC and Marvel Comics, not many people have a secret identity. Although I am very open about being trans today, I maintained a secret identity and compartmentalized my identities for a long time. As you know, it is a lot of work protecting a secret identity. The close calls are too numerous to enumerate, but looking back, they have become anecdotes, often amusing anecdotes that I share here and there. And if I wasn't trans, this blog would not exist, nor would the word "femulate." That is not a big deal. But what is a big deal are the emails I receive every week from Femulate readers thanking me for inspiring them to escape from the closet and experience life in this world as women. Your success stories indicate that the goal of this blog is being fulfilled. Perhaps writing this blog is why God put me on this Earth as a girly boy. 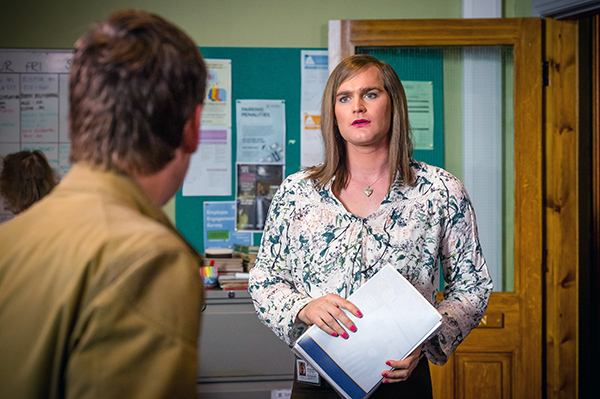 Mark Stanley plays a transwoman in the 2017 British television series Loves, Lies and Records. 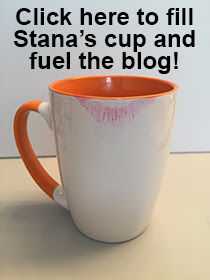 I thank you from the bottom of my girly heart for you, your life and your blog. I thank people like you are trailblazers. It feels good that I have been able to fold, spindle, and mutilate my man card. I have my hair past my shoulders and have developed DD cup breasts thanks to M2F HRT. So for me there is really no boy mode even when I wear men's clothes. I still identify myself as male, as well as using my legal name John rather than a feminine name, and my singing and speaking voice is bass. I now can be myself instead of having to conform to the narrow conventions of how men should dress, groom themselves, and behave. Nice sharing, I appreciate it! As long as you don't try getting changed in a phone box! Stana, you were a big part of my decision to get out of the house in the clothes I love so much. I don’t wear a wig, padding or makeup so I present as a male in a pretty dress and heels. I figure people got used to women wearing pants to work 40 years ago and more recently the public has accepted facial piercings, visible and extensive tattoos and blue hair. Is it such a stretch to accept the fact that some men like to wear lovely feminine clothes and shoes? From the reactions I’ve gotten , I’d have to say people are okay with it. Especially women. I think they realize that a man in a dress shows everyone that a dress does not make a woman a woman nor does it make a man any less a man.